And now there are only five! Peg left early in the morning for her drive to the Dartmouth-Brown game. The decision was made before retiring last night that a trip to the Laundromat after such a wet ride would be first on the agenda of the day after breakfast, of course. The plan was to have a quick coffee and roll and the small cafe on the premises and then head out. However, it was discovered that The Publick House has a Sunday morning brunch and that immediately changed the original plan. Coffee cake, sticky buns, Indian Pudding along with the usual eggs, bacon, sausage, fruit, juice, omelets, were all just laying out there in front of us beckoning for us to partake in the event. It would have been a shame to not try one of those homemade sticky buns, especially after riding such a hard ride the day before! Full and ready to tackle the chores of the day found several of us sitting at the local Laundromat passing time with some of the locals. 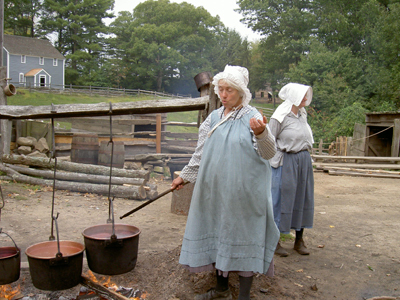 Then it was back to the hotel to quickly deposit our clean clothes and head out to Sturbridge Village. 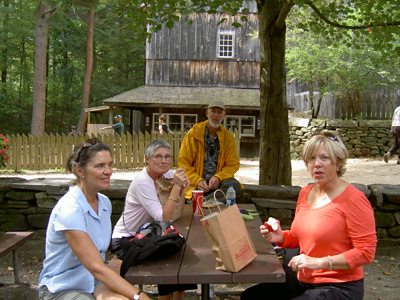 September is Senior Month there meaning a 10% discount on the entrance fee and any purchase on the property. To our amazement, none of us qualified!! We were too young!!!! 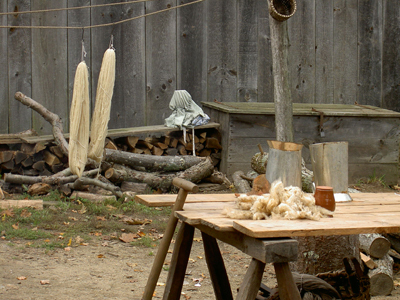 The village, itself is a restoration project to show what life was like back in the early days of this country. 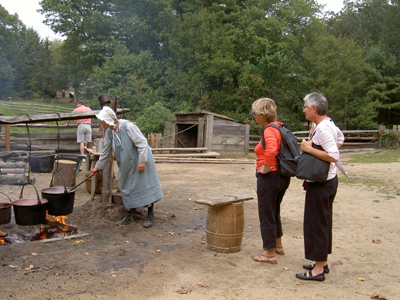 Set up in the same manner that a town of the 1700 and 1800s would have been, the public is encouraged to roam in and out of the buildings and in many converse with the docents dressed in period costumes. It is easy to forget that it is the 21 century as one drifts from home to store to bank to barn. With but a little imagination one can transform oneself back in time. A biker's work is never done. Touring the village and then on to cleaning the bikes. Each one was filthy from the road grime and rain, so needed to be cleaned and relubricated for the next day's ride. The only problem was minor -- the cleaning area was the balcony of the motel and the maids were trying to go from room to room. What's a little grease on a clean towel? Chores done, rest time until dinner, and then to bed early. Peg should be back sometime tonight. Tomorrow is a riding day and the forecast is for sun!! 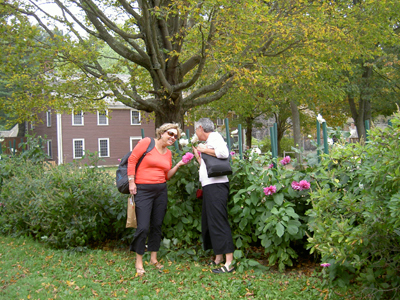 Lee & Jan Stopping to Smell the Flowers!